Fun Phone Apps for Kids | More Crunchy Beach Mama! iPhones are new to us. Hubby has been busy finding apps for us that we would enjoy. The big boys caught on fast and have had fun downloading games to play. Then we learned there are apps for babies/toddlers/preschoolers too! I recently took all three boys on an airplane by myself. I thought this would be the perfect time to test out some apps for P’Diddy. He loves holding my phone, pushing buttons, and listening to music. I was hoping these new apps I found for him would help occupy him and give us something to do as he sat on my lap for a couple of hours. 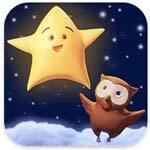 Twinkle Twinkle is an interactive picture book/video/counting activity app. There are three sections you can choose from. ~ Read the story…pick read to me, read myself, or auto-play. This last option not only reads the story to you, but turns the pages on its own. I love this last choice for baby, but will be great when he starts reading on his own too! ~ Watch a video while a child or adult (you decide the voice) sings Twinkle Twinkle Little Star a couple of times through. Of course we sing along with them! ~ Count all 20 stars. Little Star will be proud of you! I think this app is awesome because of the 3D animation. The characters, owl and little star, are so clear that you want to reach out and touch them. When you do they move about and make noises. Very cute and very fun for our little ones! Did you know that your favorite childhood books can be found? Oceanhouse Media has them all! Dr. Suess, Five Little Monkeys, and lots more! We tried a few of the Dr Suess out ~ Hop on Pop, One Fish Two Fish, & ABC. I wasn’t quite sure what to expect but they are just like the books. Each page or two comes on the screen and if you choose the read-to-me or auto play option the narratator tells the story. One of the neat features is as the story is being told the word is highlighted when it’s being read which makes it easy to follow along and for the children to learn word recognition as they get older. There are also touch options and when you put your finger on the car then the word car jumps out at you. The Little Critter books by Mercer Mayer are always top choice reads at my house! All By Myself was a perfect one to get right now because at 18 months, P’Diddy is starting to want to do everything all.by.himself. whether it’s folding my laundry (or throwing it out the basket) to brushing his teeth (or licking the toothpaste off the brush). Glad we have Little Critter on the iphone now and can take him everywhere with us! Was there a series that you have every single book? Berenstain Bears was the one my younger brothers collected. I think we had them all! But did you know that there is a baby Honey Bear now? I must be getting old as I haven’t read the new ones. 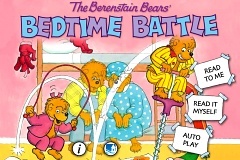 That is why I was excited to get The Berenstain Bears’ Bedtime Battles by Jan & Mike Berenstain. A great one to read at night as we watch Sister and Brother Bear get ready for bed too. We giggle as they use the same antics to stall their bedtime rituals. All these stories have super cute sound effects – birds chirping, doors creaking, and other fun noises to make the book more engaging. Have you found any phone apps that your children enjoy? I received these apps for review and all opinions are my own.